Getting Married? Congratulations! You just set the date for the most important day in your life. Your wedding day. Imagine...It is your wedding day. Your very own wedding day! It will be fun. Here are ten essential steps that will make the preparation fun too. 1. Keep within your financial limits. Budget your wedding. You do not want to start your married life in debt. If you are organized have a plan and are creative, whatever your budget, a "wedding to remember" will be yours. 2. Now Visualize. That’s right, visualize. Close your eyes and look at the tasks at hand. The list may SEEM overwhelming but it isn't. 4. Now you are ready to make a Top Ten (or top eleven or twelve) list. 5. Break your list it into small manageable portions that you can successfully accomplish. Use categories like... Before the wedding - During the wedding - After the wedding. 6. Now use sub categories. Include ideas for related events such as, showers, receptions, and honeymoon. 7. It is YOUR wedding. It reflects YOU. No one should dictate to you what to do and how to do it. You may seek advice, ideas and wisdom but in the end each final decision is yours. 8. What this means is don't be shy! Accept assistance when offered and solicit involvement, help and ideas from those you believe will be an asset. 9. Add your personal touches. For example; if you have children you may consider making them an important part of your wedding. 10. Pick a few aspects of your wedding and make them personalized. 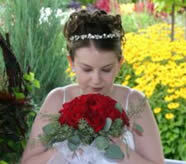 A personal touch makes a wedding meaningful to the bridal couple, their attendants, family and all invited guests. In summary, your wedding is a serious moment for declaring your love and commitment to each other. Make your wedding truly a one-of-a-kind event. Fill it with cherished moments and keepsakes. Whether you choose a favorite theme, a special setting or an intimate gathering of friends and loved ones, enjoy the journey. Perhaps, the memories and keepsakes may stay with you forever. Treasure them! And may you have a Happy, Happy day!